PET Compressor - Global Cynax Bangladesh Ltd. Specifically designed for demanding PBM applications, Ingersoll Rand MSG® Centac® centrifugal compressors require very low maintenance having few moving parts and no components that can wear out. Their compact, innovative design delivers exceptional levels of reliability to keep your operation running smoothly at peak performance. Large PET bottle production can often consume great quantities of high and low pressure air. A primary booster system provides flexibility to meet changing demands. 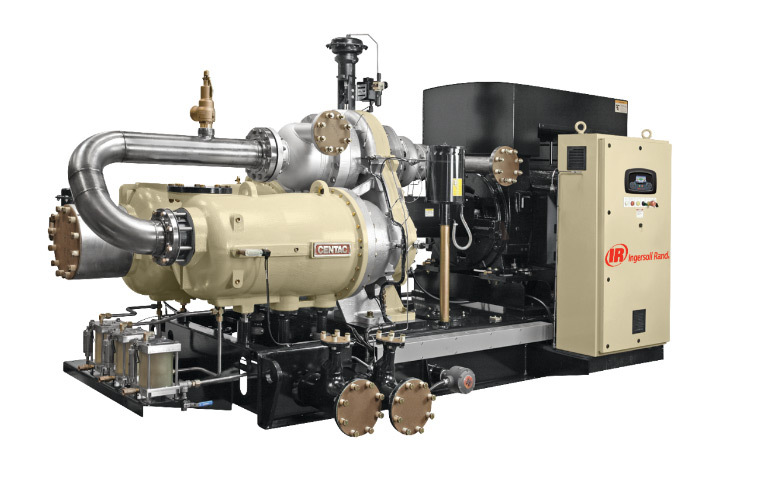 The Ingersoll Rand primary booster system provides a modular approach that features a primary compressor augmented by a booster. The primary compressor can be an oil-free rotary or centrifugal compressor matched to your needs, while a two-stage, non-lubricated reciprocating compressor serves as the booster to easily adjust system capacity when demand changes. System capacity can be added independently to each circuit allowing for modular expansion. Oversizing the primary compressor is an efficient method of providing low-pressure, oil-free air for plant use. A standard low pressure dryer provides dry air and reduces possible freeze-ups due to high pressure condensate removal. Ingersoll Rand PETStar® 4 reciprocating air compressors offer durability and reliability combined with four-stage energy savings. Standard PET reciprocating compressors feature three-stage compression. Ingersoll Rand maximizes efficiency with four stages of compression, which significantly increases efficiency over three-stage designs. Combined with industrial grade components and double-acting cast iron cylinders, PETStar® 4 compressors provide supreme durability that reduces maintenance requirements and lowers lifecycle costs.